When you have a house this big, overlooking a large swimming pool AND the Colorado River, not just any deck will do. 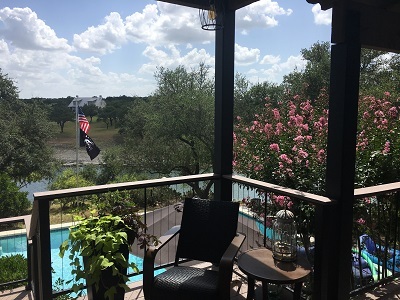 You need a very special deck, a one-of-a-kind deck for this one-of-a-kind Texas Hill Country home situated between Lago Vista and Marble Falls, TX. 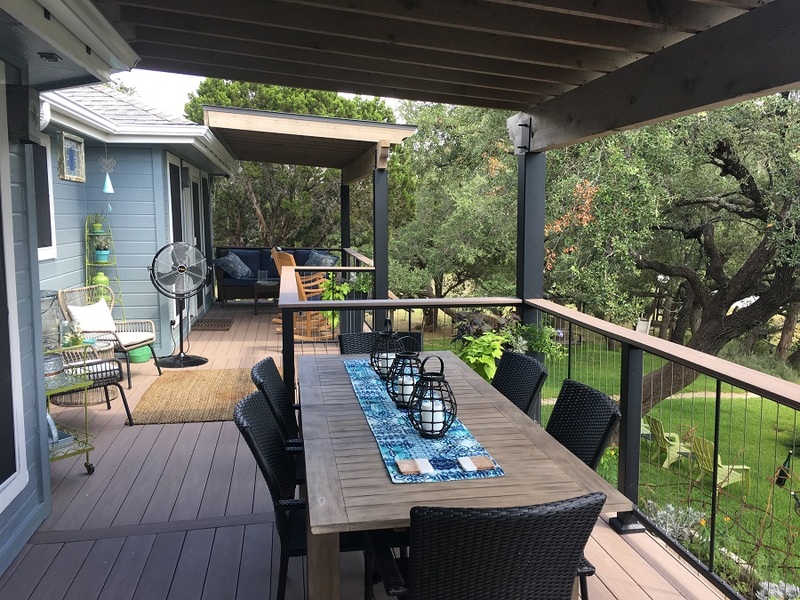 Archadeck of Austin was the right company to design and build this splendid deck with four pergolas. 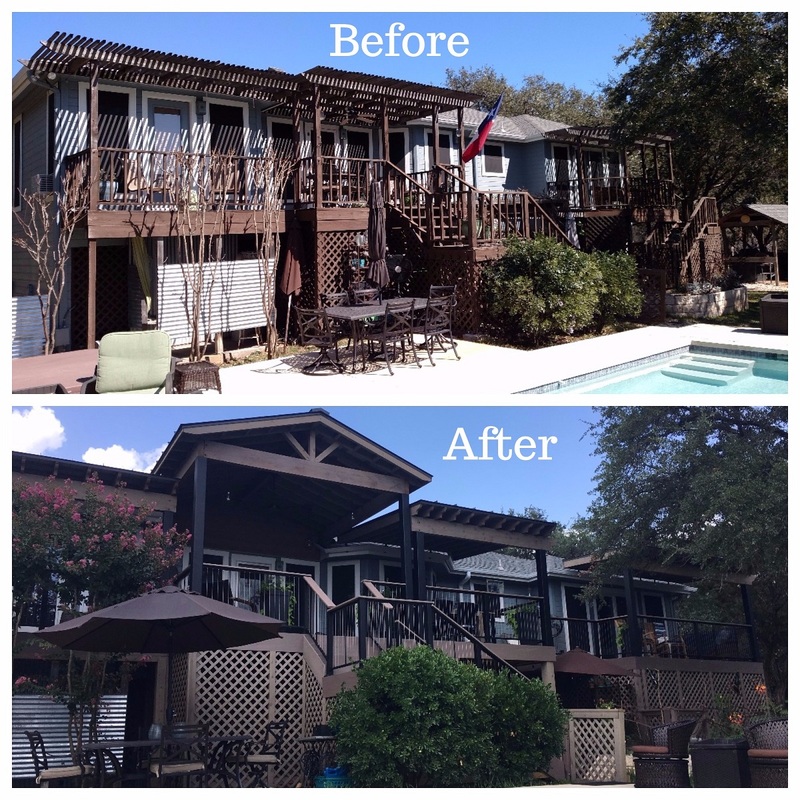 The homeowners wanted their old wooden deck replaced with a larger deck made of low-maintenance material. One of the criteria was that the new deck be large enough to have room for a dining table that can seat six people. We were able to achieve that by adding two feet to the size of the deck. For the decking boards the client selected AZEK decking in the autumn chestnut color, part of AZEK’s Harvest Collection.The deck features Fortress vertical cable railing with a black sand finish. 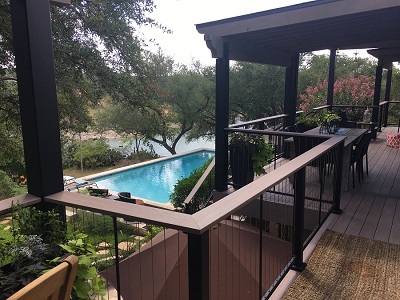 The vertical cables are marine-grade stainless steel cable, and the railing and posts have a durable, multi-layered anti-corrosion coating, virtually maintenance free and long lasting. We also replaced the old deck’s three existing pergolas with four new ones. 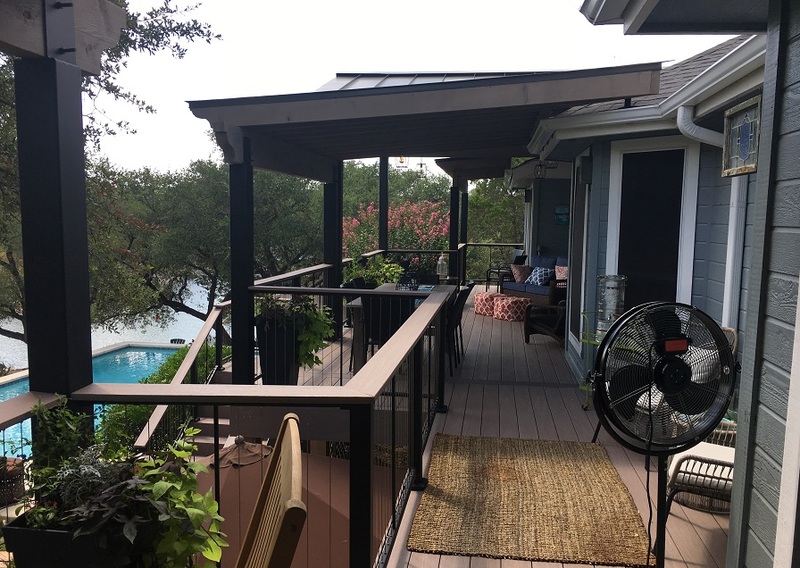 We mounted the new wooden pergolas on 6×6-inch custom-fabricated steel posts with a black finish matching the deck railings. 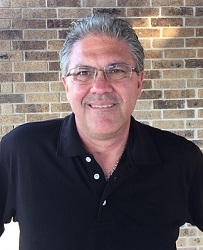 Even though the homeowners didn’t want a roofed structure tied into the roof of the home, they did want a roof over each of the pergolas for additional shade. We installed a standing seam metal roof over each pergola. Three of those are flat roofs, while the fourth is a gabled roof that covers the portion of the deck opening out to the stairway leading down to the pool.The gabled pergola is tied into the roof to make it more rain tight. The gabled roof design of the fourth pergola provided a covered space for sconce lighting and a ceiling fan. Archadeck of Austin did all of the necessary electrical work to add these finishing touches. 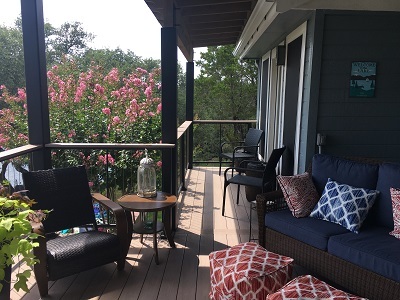 To complete this low-maintenance project, we added wooden latticework underneath the deck. All of the wooden surfaces were stained in a subtle gray color. This handsome new deck, nicely shaded, accommodates the entire family as requested. No one will be left out as they dine al fresco overlooking the river and the pool. Furnished with a collection of comfortable seating including a couple of rocking chairs, this grand deck is a crowd pleaser. 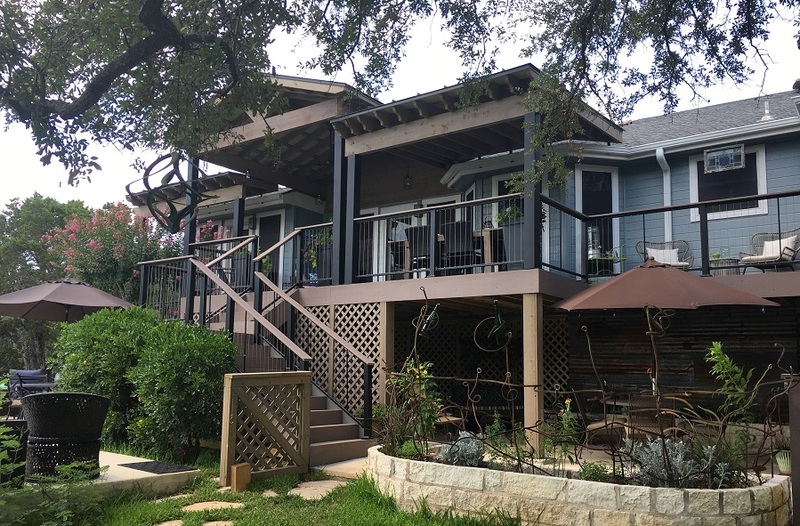 If you are looking to expand and replace your existing deck, or create one from scratch, contact Archadeck of Austin today at (512) 259-8282 or via email at [email protected] to schedule a free design consultation.